I don't know how you could not love Teva's Mush Sandal. At home on the beach or a Summer sidewalk, the Mush is a comfortable and affordable classic flip-flop, no frills required. At the same time, the Mush isn't just a disposable flip-flop in a discount drug store barrel. The soft-yet-sturdy Mush is capable of providing more than just one Summer's worth of service. A pair of Mush sandals are also unusually light, weighing only 5.6 ounces (measured) in Men's size 8, making them an appealing choice as at-camp footwear on overnight backpacking trips. In addition to my regular flip-flop needs, I've been turning to the Teva Mush for another job: after-hike comfort. After blasting the life out of my feet on the trail, it sure feels wonderful to switch to a pair of these when I get back to my car. One of the Mush's singular qualities is its comfort. I forgive you if you're feeling a little skeptical. I wasn't expecting much when I first tried on a pair, figuring that one brand of flip-flops would pretty much feel like any other. But Teva has built the upper 7mm of the Mush's sole from a wonderfully light EVA foam that actually compresses and squishes to fit the shape of your foot—without feeling loose or sloppy underfoot. This, you soon realize, is why they call it the Mush. It feels a bit like stepping into a bowl of Mush—but in a good way. 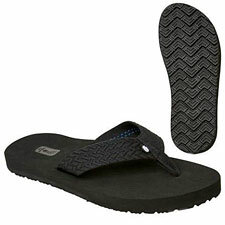 Complementing the soft foam of the topsole are soft, smooth, lightweight tubing for the straps. The combination feels ridiculously luxurious for a flip-flop. Then again, why shouldn't your sandals be outrageously comfortable? Meanwhile, the bottom of the Mush is sturdy enough to walk around town without disintegrating on you. As for more ambitious scrambling, I've done quite a lot of desert hiking in Teva sandals, but I'm not going to say the Mush is in the same category of ruggedness as, say, Teva's Universal Buckle footwear. The Mush is best reserved for casual duty. These are flip-flops after all. But as flip-flops go, I'm calling these perfect. Be it the beach or boardwalk or walking around the block, I love 'em. Their simple, classic styling suits me, and the price at this quality level looks like a misprint. Teva's Mush sandals are so good they might just make you want to leave your shoes behind forever—at least until the next time you're ready to hit the trail. These are highly recommended!